Placing users in the cockpit of a nitromethane top-fuel dragster, literally and virtually, and bombarding their senses with the audio, visual, and haptic fury of 10,000+ horsepower. NHRA races and select Toyota events are hosting this virtual reality simulator of a lifetime. Combining modified Hollywood technology, powerful partnerships and on-the-spot ingenuity, we were able to provide the high-octane thrill of a lifetime. 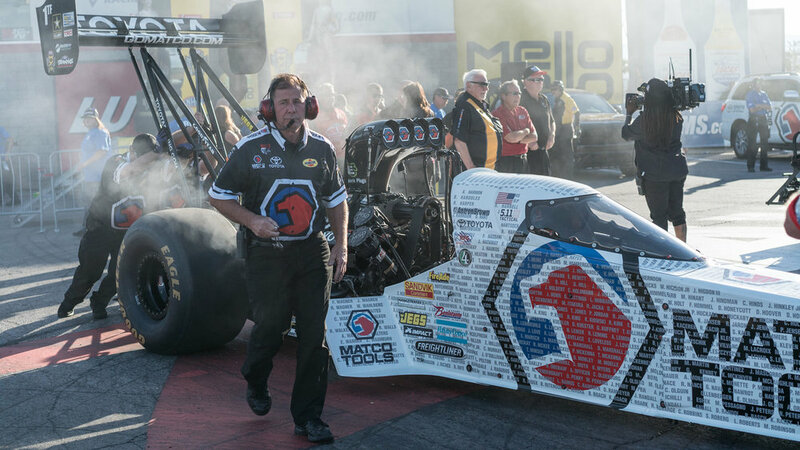 Take the seat in Antron Brown’s 2016 top-fuel chassis, don the Oculus Rift VR headset, and get ready to rumble. Enjoy a 360º view of The Strip at the Las Vegas Motor Speedway as you pull into the lane and cover 1000’ in less than four seconds at 322.42mph, complete with audio and vibration produced by more than 10,000 horsepower. This virtual reality experience takes watching drag racing to a whole new level! Intense vibration. Extreme heat. Absurd sound pressure levels. G-forces exceeding 6Gs. And only a few seconds to capture the moment. a learning opportunity, from the heat killing high dollar batteries to the lens’ gun-threading from the body due to the vibrations encountered over 300mph. took a page out of Hollywood’s book and shot with the Codex Action CAM. It’s the smallest form factor camera using a a 2⁄3″ CCD sensor and most importantly utilizes a global shutter - crucial for eliminating the nauseating jello-effect seen in most race videos. The camera was affixed to the canopy above Antron’s helmet via a custom-fabricated mount and due to the lack of available space the solid-state recorder and power assembly was stored in a custom-fabricated insulated box, stationed between the rear wheels. vibrating the VR simulator the actual information captured from the dragster during the pass down the strip. This simulator was recently released into the wild during NHRA Chicago to rave reviews. Fans, both young and old, were queued in long lines for a chance to take Antron’s car down the strip and all emerged with huge smiles on their faces. There are even rumors that similar experiences for fans of other drivers may emerge soon. © 2013-2017 Ubivue. All Rights Reserved. Read our Terms of Service.